NEWTON, Iowa (November 10, 2015) – The Iowa Barnstormers Free Agent Camp kicks off Saturday, Nov. 14 in Pella, Iowa where players from around the country will work to earn a spot on the Barnstormers’ 2016 roster. One implausible player hoping to land a roster spot will be Iowa Speedway President Jimmy Small. Named one of the top 10 sports executives under the age of 30, according to SportsPro Magazine, Small will temporarily relinquish negotiating contracts and race sanctions in favor of reading defenses and running pass routes. The former high school basketball standout will be “coached” by current Iowa Barnstormers during the tryout. The annual open tryout will take place Nov. 14 at the Pella Recreation Center Field House in Pella. The tryouts are open to the public including Iowa Speedway race fans. 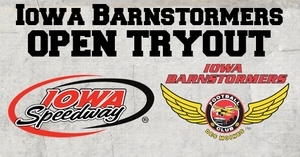 Any athlete 18 years of age and older, non-college eligible and interested in playing for the Iowa Barnstormers Indoor Football Team during the 2016 season is invited to participate in the tryout. Registration opens at 11 a.m. CST with tryouts starting at noon. For more information and to submit a registration payment and forms, go to www.theiowabarnstormers.com. Iowa Speedway, “The Fastest Short Track on the Planet,” is a state-of-the-art 7/8 mile asphalt paved tri-oval race track and motorsports facility located in Newton, Iowa. Our 2016 schedule includes three exciting race weekends: June 18-19 (NASCAR Camping World Truck Series and NASCAR XFINITY Series), July 9-10 (ARCA Racing Series presented by Menards and Verizon IndyCar Series) and July 29-30 (NASCAR K&N Pro Series East/West and NASCAR XFINITY Series). For tickets, call 1-866-787-8946. To learn more, visit www.IowaSpeedway.com, “like” us on Facebook or follow us on Twitter at @IowaSpeedway.